Premium Compatible Label Tapes for the Dymo LABELMANAGER 150 printer. The Dymo Labelmanager 150 is an electronic label printer that is ideal for office use as it can print labels using a wide range of styles and fonts as its labelling options. As this printer uses Dymo Labelmanager 150 Label Tapes instead of toners or ink cartridges, this reduces the running costs. The Dymo Labelmanager 150 can also print labels for home use or for school purposes. This label printer is extremely lightweight and weighs around 0.22 kgs. This label printer has a large LCD display and a QWERTY keypad. This label printer also has a manual cutter integrated with it. This model of Dymo printers has navigation keys and function buttons on the front. The LabelManager 150 can offer different possibilities for labelling due to its 7 print styles and 3 built-in fonts. The peeling of labels is also quite easy but it lacks an automatic cutter. This label printer also has a print preview option which allows it to preview the labels. 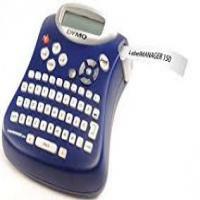 The Dymo Labelmanager 150 is a label printer that is a great choice for office work. This printer supports both horizontal and vertical printing and offers a wide range of styling and effects. This label printer also has print preview option. But this printer is very lightweight and not easy to hold due to its shape. Automatic cutter is not present and also it lacks an LCD display. Q. How to set the font size for my Dymo Labelmanager? A. Three font sizes are available for your labels: Narrow, Normal, and Wide. When you specify a font size, that size applies to all characters on the label. Press the Font/Fixed Length key. Use the arrow keys to move to the desired font and then press OK.
Q. Can I print multiple copies of the label using Dymo Labelmanager 150 ? Press extra and then use the arrow keys to select the copies. Press the Up arrow key to increase the number of copies you want to print. Press the Down arrow key to decrease the number. Press OK if the number of copies is set. After you print the label, press clear in order to turn off the fixed length setting otherwise, all other subsequent labels will get printed with this fixed length only. Q. What should I do if the Dymo Labelmanager 150 Label Tape jams? A. The Motor might be stalled due to Dymo Labelmanager 150 Label Tape jam. Remove the jammed tape and replace tape cassette with the new one to continue printing labels. Q. Print failed! An undetermined error occurred. What should I do now? A. Check for the Dymo Labelmanager 150 Label Tape jam, empty tape cassette, discharged batteries, clogged printheads or any other problem. This type of error can be occurred due to one of these reasons described above. If the problem still persists contact customer service for help. Q. Why it is important to care for your printer? A. Your LabelMaker is designed in a way to offer you a wide range of possibilities for labeling and giving you long and trouble-free services while requiring very little maintenance. Cleaning of LabelMaker from time to time is important to keep it working properly. Remove the Dymo Labelmanager 150 Label Tape. Insert the tip of a ballpoint pen or pencil between the L-shaped piece and the guide pin. Press and hold down the cutter lever to expose the cutter blade. Use a cotton ball and alcohol to clean both sides of the blade. Q. Can I preview the text before it gets printed on the machine? A. Yes, the Dymo Labelmanager 150 has the option to preview the text or format of your label prior to the printing. Q. How to align the text? Press Shift-Frame or align option. Use the arrow keys to select the desired alignment and then press the OK button. Press the clear button to turn off the alignment setting. Q. What are the terms of cancellation, if I have ordered the wrong product? A. If you order any product on this site by mistake, you can return the item unopened for up to 7 days following the receipt of the product purchased. If the order has not been dispatched and you have applied for cancellation, then we will just cancel the order and refund your payment in accordance with our refund policy. If the order has already been dispatched, you can refuse to sign for the product at the time of delivery and we will refund payment in accordance with our refund policy below. Alternatively, if the order does not need to be signed in, you can follow the procedure as described in Terms and Condition page under ‘Non-faulty items’. Q. What should I do if the ink ribbon is broken? A. If the ribbon is broken, in such case, replace the Dymo Labelmanager 150 Label Tape with the new one.